Chancellor Kent Syverud headlines a team of University leadership traveling to China to participate in a series of programs for University alumni, students and families during the month of May. 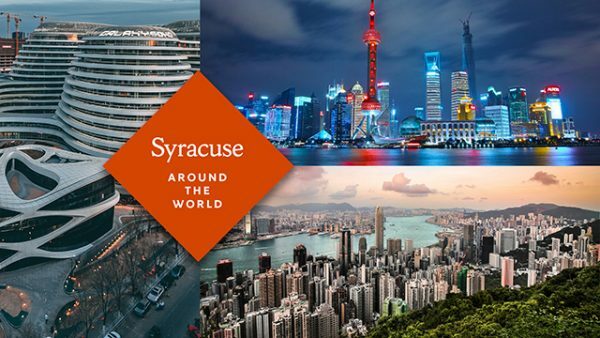 “Syracuse Around the World” will be held in Hong Kong (May 19), Shanghai (May 21) and Beijing (May 23). The alumni-moderated panel discussions will showcase ways in which the University is expanding its global footprint and bolstering its profile as a top-rated international research institution. The event in Hong Kong will be held Saturday, May 19, at 1 p.m. at the American Club Hong Kong and will feature Chancellor Syverud; Lorraine Branham, dean of the S.I. Newhouse School of Public Communications; and David Van Slyke, dean of the Maxwell School of Citizenship and Public Affairs. Kitty Lun G’80, head of creative shop for Greater China at Facebook, will serve as the afternoon’s moderator. Chancellor Syverud and Dean Van Slyke will be the panelists for the program at Shanghai’s Fairmont Peace Hotel at 7 p.m. on May 21. Alton Chow G’97, vice president and managing director for Central China at AECOM, will serve as the evening’s moderator. The program in Beijing on May 23 will feature Chancellor Syverud, Dean Branham, and Zhanjiang “John” Liu, SU’s vice president for research. Matt Rivers ’10, CNN international correspondent, will moderate the evening’s discussion at Beijing’s Westin Hotel. The event will begin at 7 p.m.
Each of the two-hour programs will include a reception, allowing attendees the opportunity to speak with the panelists and connect with other Syracuse University alumni. Anyone interested in attending the programs may register online at http://cc.syr.edu/syracusearoundtheworld. Walk-up registration will also be available at the time of the programs.